A short list of ingredients is all you need to create these beautiful, irresistible gems. Allow butter and cream cheese to come to room temperature, and cream together with an electric mixer or stand mixer until fluffy. In another bowl, mix flour, sugar and salt, then pour into the butter and cheese mixture and beat to combine. Form dough into a 2-inch thick square and wrap tightly in plastic; chill 4 hours or overnight. Line a sheet pan with parchment paper. Roll out the dough to a 12 x 12-inch square, about 1/8-inch thick. Divide into 4 even squares, then divide each again into four smaller squares to make 16 cookies. Spoon one heaping teaspoon of jam into the center of each square. Fold the two opposite corners to the center, their points touching. Place each formed cookie on the prepared pan, then chill the entire pan for an hour. Heat the oven to 325°F. Bake cookies for about 25 minutes, until the edges are golden brown. Transfer the cookies to racks to cool. When completely cooled, dust with powdered sugar, if desired. Store in an airtight container for up to a week at room temperature. Serve a plateful of these delicious gems with a tall glass of iced tea or a hot espresso for an irresistible treat. 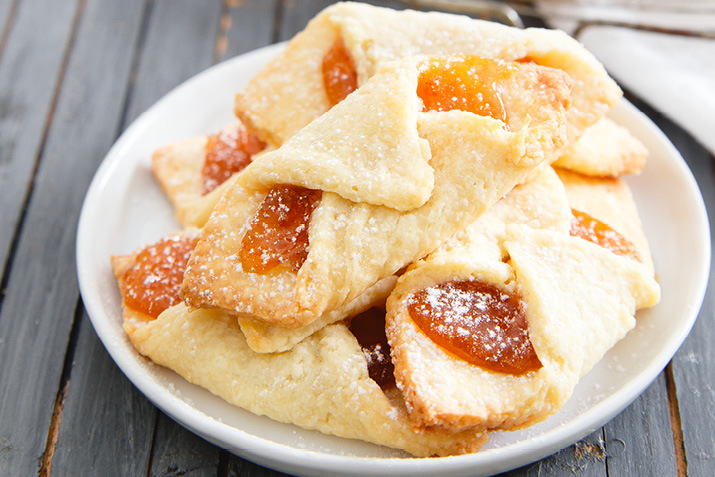 While apricot jam is a traditional filling, you can also use blueberry or strawberry compote or apple pie filling.